Trinity University Press, 9781595341464, 628pp. Definitive and daring, The Ecopoetry Anthology is the authoritative collection of contemporary American poetry about nature and the environment--in all its glory and challenge. From praise to lament, the work covers the range of human response to an increasingly complex and often disturbing natural world and inquires of our human place in a vastness beyond the human. 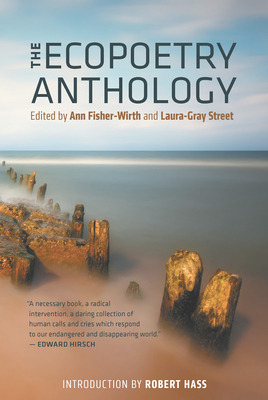 To establish the antecedents of today's writing, The Ecopoetry Anthology presents a historical section that includes poetry written from roughly the mid-nineteenth to the mid-twentieth century. Iconic American poets like Walt Whitman and Emily Dickinson are followed by more modern poets like Wallace Stevens, William Carlos Williams, Ezra Pound, and even more recent foundational work by poets like Theodore Roethke, Elizabeth Bishop, Robert Hayden, and Muriel Rukeyser. With subtle discernment, the editors portray our country's rich heritage and dramatic range of writing about the natural world around us. Ann Fisher-Wirth is the author of the poetry collections "Blue Window" (Archer Books, 2003) and "Five Terraces" (Wind Publications, 2005). She has also published the chapbooks "The Trinket Poems" (Wind, 2003) and "Walking Wu Wei's Scroll" (Drunken Boat, 2005). In 2004 she received the Rita Dove Poetry Award from the Salem College Center for Women Writers, the Poetry Award from the Mississippi Institute of Arts and Letters, and a poetry fellowship from the Mississippi Arts Commission. She won the 2003 Malahat Review Long Poem Poetry Prize for "Olaus Magnus, Carta Marina," the first section of the booklength poem "Carta Marina." Her poems have appeared in the "Georgia Review," the "Kenyon Review," the "Connecticut Review," "ISLE," "Solo," "Feminist Studies," "RUNES," and many other journals, as well as in anthologies and online. She has been awarded residencies at the Mesa Refuge and Djerassi, both in California. A professor of English, Fisher-Wirth has taught as a senior Fulbright lecturer at the University of Fribourg, Switzerland, and as a Fulbright Distinguished Chair at Uppsala University, Sweden. She currently teaches at the University of Mississippi. Her academic publications include the book "William Carlos Williams and Autobiography: The Woods of His Own Nature" and numerous articles on American writers. Laura-Gray Street has received a poetry fellowship from the Virginia Commission for the Arts, the Dana Award in Poetry, and the Greensboro Review Award in Poetry. She was also the 2003 poetry winner in the Emerging Writers Contest sponsored by the Southern Women Writers Conference. Her poems have appeared in "Shenandoah," "Meridian," the "Notre Dame Review," the "Greensboro Review," the "Yalobusha Review," the "New Virginia Review," and the "Poetry Daily" website. She has been nominated three times for a Pushcart Prize, and her work has been commissioned by the New York Festival of Song. Street has been a fellow at the Virginia Center for the Creative Arts and writer-in-residence at the Artist House at St. Mary's College in Maryland. She is an assistant professor of English at Randolph-Macon Woman's College in Lynchburg, Virginia. Robert Hass has served as the U.S. Poet Laureate and is the author of many best-selling poetry collections, most recently "The Apple Trees at Olema He has received the Pulitzer Prize, two National Book Critics Circle Awards, and the National Book Award, as well as numerous other honors, including a MacArthur fellowship. He has written several books of prose books, including "Twentieth-Century Pleasures, " and has translated the work of Nobel-prize winner Czeslaw Milosz. Hass teaches at the University of California, Berkeley, and lives in the Bay Area.